Even though it might seem a little bit weird to be sharing with post, since I have a lot of Czech readers, who know our capital more than well, I get more and more questions on my Instagram "Where to eat in Prague?" or "Where to shop?" and "What's worth seeing?" Just because of that I decided to share my Guide to the capital of my country, which I hope is going to be helpful to you! I am not from Prague, I wasn't born there, yet I remember going there from a very young age since my dad works there and now I spend there a lot of time as well, so feel like I know myself a little bit around! Na Instagramu dostávám prakticky denně otázky ohledně tipů do Prahy. Chodí mi od internacionálních sledovatelů a proto jsem se rozhodla sepsat článek s tipy ohledně Prahy. Jelikož je tento post relevantní spíše pro zahraniční čtenáře, rozhodla jsem se ho napsat pouze v angličtině. Prague is an old, beautiful and historical city, so if going there, you should definitely visit of the famous sights we have in our capital - and trust me, there are a lot! - Prague Castle: Just like Eiffel Tower in Paris or The Empire State Building in NYC, the Prague Castle is the symbol of the city. Not only gives you the castle a beautiful overview over the whole city, but it's also a really beautfiul building inside! - Charles Bridge: Another sight, which can't be missed when visiting Prague! The oldest bridge over the river "Vltava" is definitely a must-see! - Old Town Square: Old Town Square is probably the most famous and historical square in Prague. Besides many restaurants and stores, you can find there the famous clock "Orloj", which gives you a little show every round hour. Besides that you can also visit The Old Town Hall and clim it up and see Prague from the top! - Žižkovská věž: This TV Tower is one of the highest points in the city! There is an observatory in the building, which gives you the perfect view on the whole city (seriously one of my favourite places to go for a view!). Besides that there is a hotel, a bar and a restaurant in the building. - Náplavka: This place is basically any "riveriside", where you can go one a walk and enjoy the atmosphere of the city. I really love going to the river, because in my opinion it looks really beautiful there! - Petřín: Petřín is a big park, in which you'll find not only many path to walk on, but also an observatory point, which looks a little bit like the Eiffel Tower. If you're visiting Prague in summer, definitely worth walking up the hill and going there! 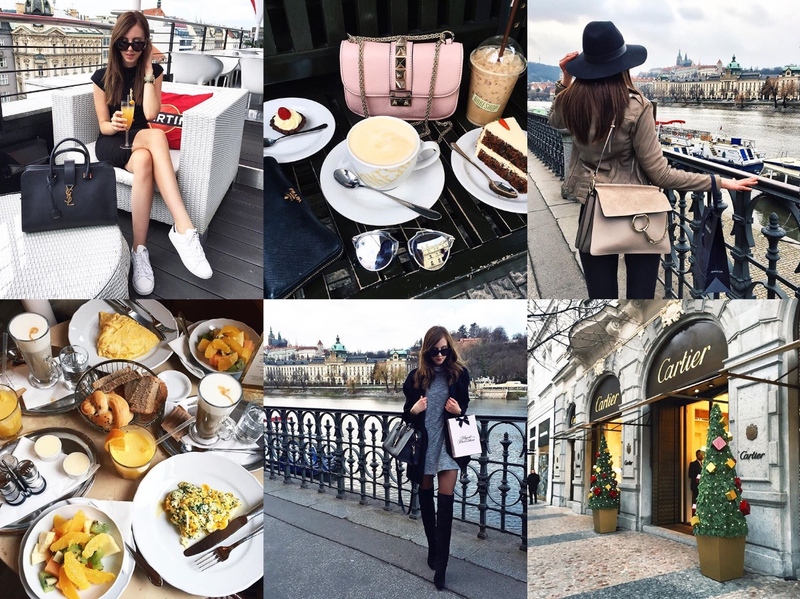 - Café Savoy: This is one of my favourite breakfast/brunch places in Prague! The small café offers everything you need for the perfect breakfast and brunch! They also have a later menu, but I never tried that one - for me it's THE breakfast place! 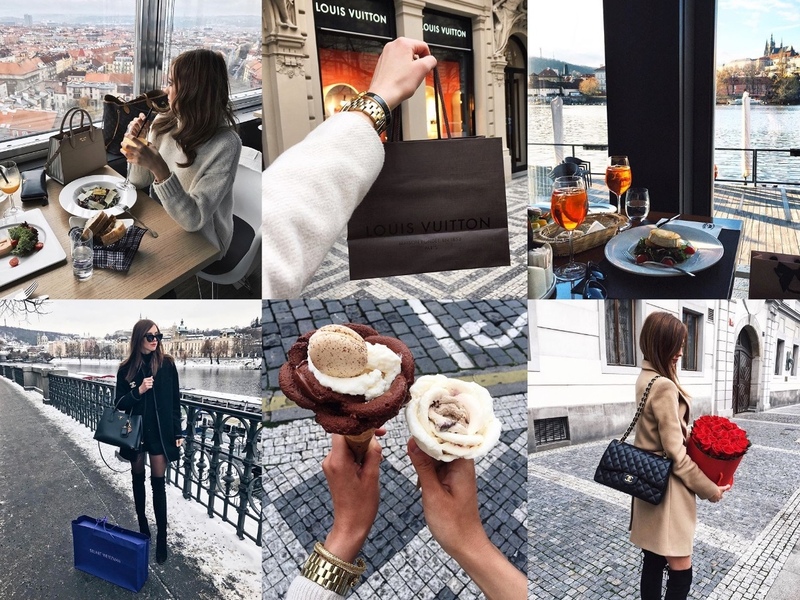 - Cacao Prague: This is a place I go to A LOT. They have the perfect central location and offer anything you can imagine - from breakfast, which includes acai, eggs, smoothies, cafes and matcha lattes, over lunch and dinner, where you can select from many meals - soups, sandwiches, salads, etc. Besides that they have some gluten-free options in the menu as well, which to me is really important - I highly recommend their gluten-free strawberry cheesecake - YUM! - BakeShop: BakeShop is my number 1 place to go for 2 things: their carrot cake, which is to die for and their pumpkin soup, which I absolutely love! BakeShop is a bakery and a bistro, where you can select from many cakes, macaroons, cupcakes, salads, soups, coffees, teas and juices. They have everything prepared you if you're starving you can quickly grab something! - UGO: This is the new of "healthy" fastfood. Ugo offers fresh juices, smoothies, homemade 100% fruit ice cream, granola bars, healthy wraps, many salads and soups. They have many locations in Prague and they're really popular, which is no wonder - their food is delicious and the chain is cheap and quick! - Pizza Coloseum: Another place with several locations in the city is Pizza Coloseum. This Italian chain offers not only traditional dishes like pizza, pasta, salads or desserts, but also burgers, a lot of fish and meat. What I like about the place is that you can get quickly a meal and you don't pay a lot for it. - Oblaca: I already mentioned the TV Tower in the first part of the post. Oblaca is a restaurant, which is a part of it. Now this is a place, where I go because of the view. I have to say that the service is really miserable there and they have a really tiny menu, but to me it's still worth it! - Terasa U Zlaté Studně: Now that I told you my "cheaper" places, let's start with the fancy restaurants. Terasa U Zlaté Studně is a beautiful restaurant with the perfect view on the whole city. I recommend going there especially in summer, when the terrace part is opened. You can enjoy one of the best views in the city together with a culinary meal, which tastes like heaven! Yes, the place is pricey, but definitely worth going! - COMO: Como is a restaurant located on the Wenceslas Square. They have a bright variety of meals - salads, meat, fish, sushi, drinks, cocktails, wine - simply everything. I usually go there only for a Daiquiri, which I think tastes there very good! - Duplex: Duplex is a bar, restaurant and a night club located, also, on the Wenceslas Square. I usually go there in the summer for a drink with my best friend - they have a nice terrace with a view on the whole square! - Hergetova Cihelna: Another restaurant with a "view". This one is located in the part called "Malá Strana", just a few meters away from the Charles Bridge. The restaurant has a romantic atmosphere with a view at the river and Charles bridge. - Grosetto Marina: Grosetto Marina is an Italian restaurant located in a boat. The restaurant is at the Old Town riverside and has the perfect view on the Prague Castle. Definitely a place worth going for a lunch or dinner! - Terasa U Prince: The last, but not least restaurant, is Terasa U Prince, which is a terrace with the perfect view on the Old Town Square. They have a bright selection of meals, drinks and cocktails. However if you're going to Prague in winter, I highly recommend to skip this one - if you go there, you'll freeze. - Amorino: If you're going to Prague in the summer, definitely make a stop at Amorino, which is an international ice-cream chain. They have the prettiest rose-shaped ice cream with (optionally) macaroon on the top - REAL PERFECTION! - Pařížská: Pařížská is a street connecting the Old Town Square with the river. In this street you'll find many luxurious and high-street brands. 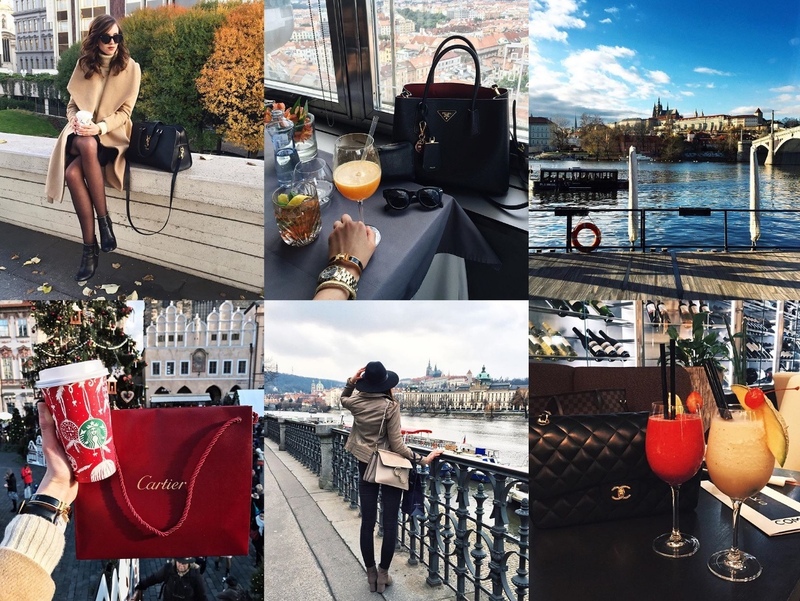 If you're looking for brands like Cartier, Louis Vuitton, Prada, Hermés or Gucci, this is where to go! - Palladium: This shopping mall is located in the heart of Prague. 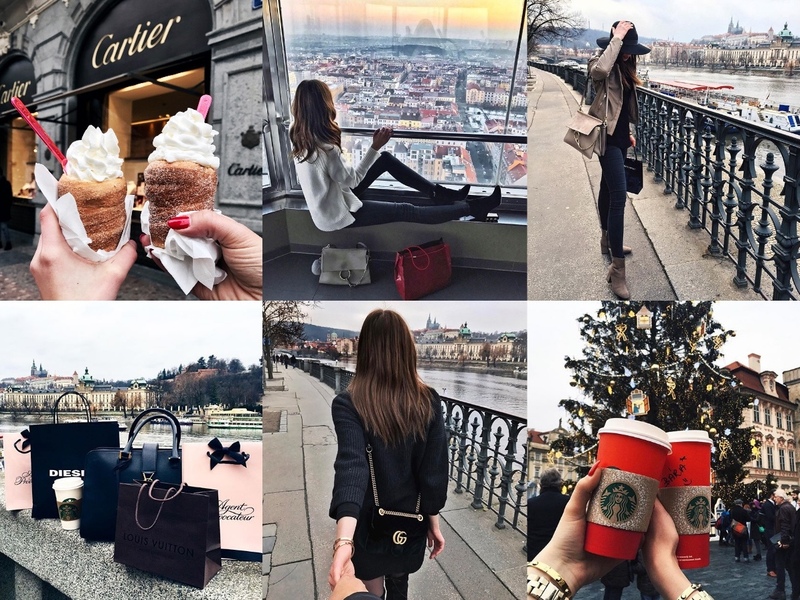 They have many international brands, including Topshop (the only one in Prague), MAC, Mango, H&M, Sephora, etc. - Na Příkopě: This is another shopping streets, where you can find more accessible brands like Zara, Pandora, Michael Kors, Lacoste, H&M and many more. There are also a lot of restaurants! 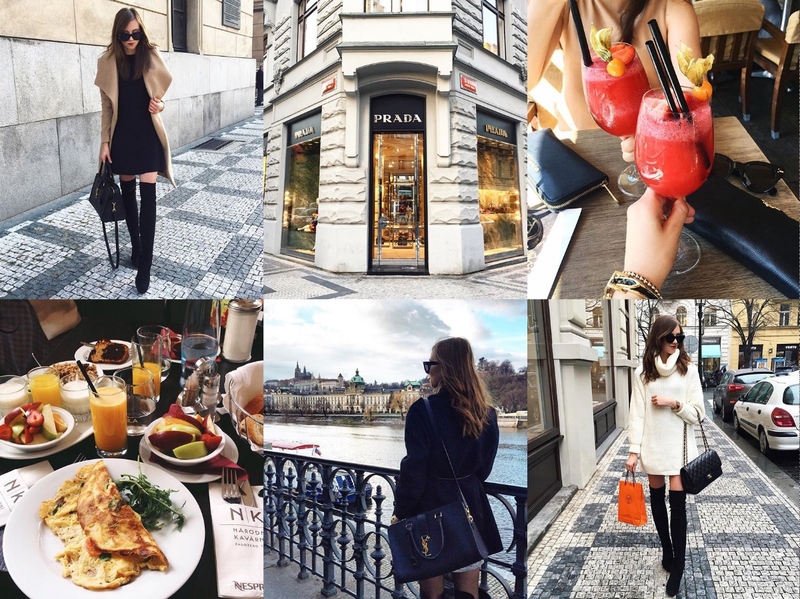 - Stuart Weitzman Prague: One of the stores, which you won't find in any streets or malls mentioned is my favourite store Stuart Weitzman - this one you'll find in the street "U Obecního Domu". So I hope you will enjoy your visit of Prague and that some of these tips will be helpful to you! If you have any questions regarding the city, please let me know in the comments! I'm planning a trip to Prague soon so this will come in very handy! I really want to visit Prague this summer, it's so beautiful! Now I am reading your wonderful guide, I realize it's too long that I've been in Prague! Thank you for sharing! Thanks for the recommendation! I will save this post for later! Skvělej článek pro zahraniční čtenáře :) A krásný fotky k tomu, jako vždycky. Really basic shits... nothing special... this kind of information you can google in 5 seconds.. I would appreciate something special not basic shits..